To throw a perfect game, a single pitcher must retire every batter, and at least 27 of them, in a victory. That we know. 2K Sports, in its "$1 Million Perfect Game Challenge, on Major League Baseball 2K12, applies a formula to those games, rating their degree of "perfection," so to speak, according to factors like pitch count and strikeouts. Here's what I didn't know until now: You are also judged on the physical perfection of your pitched game. I didn't realize this until I scanned back through the Major League Baseball 2K12 Facebook page and read something posted a month ago by the game's top man for development, senior producer Mark Little. "On top of the difficulty score, we also look at how you throw the perfect game to determine your final perfect game score," he wrote on March 27. "We look at things like strikeouts, pitch count and your pitch gesture accuracy [emphasis mine] to determine the overall perfect game score. So if you are looking to increase your score, try to maximize strikeouts, minimize total pitch count and be as perfect as you can be with your pitching mechanics. Weak pitches and bad gestures hurt your overall score." So, even if you hang a sinker with the game's right stick controls, and get an opposing batter to beat it into the ground, if you get lucky with bad stuff, that will be factored in. This is important to realize as the Perfect Game Challenge enters its final four days. After Monday, those who threw the eight "best" perfect games-judged according to the factors that Little describes—will get a trip to New York to play in an eight-man tournament for the final $1 million prize. I really had no idea it was judging your actual physical gestures—and if you throw a weak pitch or make a bad gesture, the game will inform you of it with a map showing how your pitch command deviated from the ideal input. I just figured that the ends would justify the means. They don't. This makes early-inning pitch effectiveness critical. As your pitcher tires in later innings, he will have less time in which to complete a proper throw. While a fastball may be a two-position motion, breaking balls often require pushing the right stick to one location and then winding it. A 12-6 curveball requires the most torque. Late in the game, these will be your least perfect pitches, which makes throwing them perfectly early on even more critical. The other major factor is the degree of difficulty. As we enter the final four days of this contest, throwing a perfect game under tougher conditions becomes absolutely critical for those looking for last-minute placement in the final eight. The lowest score on the leaderboard as of writing is a 796, well more than 200 points higher than it was two weeks ago. To crack the lineup this late, you will need to throw a perfect game with a weaker pitcher against a stronger hitting lineup. 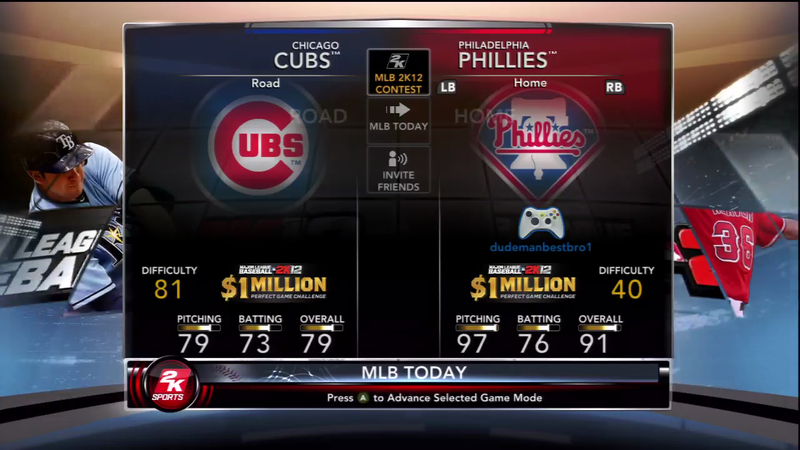 You can see the ratings when you choose a game from the "MLB Today" menu and select the MLB 2K12 Contest option. It will rate the matchup for you depending on which team you choose to pitch with. In my judgment, at this late stage, there is no reason to attempt a perfect game whose difficulty is rated below 80. Fortunately, there are four matchups today that offer such a challenge. Of these, the Yankees offer maybe the most enticement: it's a popular team and a strong batting order—you'll just be taking Ivan Nova against an extremely potent hitting attack from the Tigers (and cover star Justin Verlander). Drew Pomeranz versus the Mets, in Denver, deserves his 87 rating. Not only is it in the thin Rocky Mountain air, Pomeranz, the team's fifth starter, hasn't gone past the sixth inning in two starts. Again, this contest is over when the clock strikes midnight on May 1. So pick the toughest matchup you can find, and good luck.